One week ago, I explained the “Top 6 Ways to Promote Your Mobile App.” The sixth method suggested, “Utilize Smart App Banners on iOS 6 to direct mobile users from your full site to your app.” Haven’t heard of Smart App Banners before? Good, because then you will find this interesting (I hope)! Smart App Banners by Apple are a standardized banner that promotes your iOS app from your website when a user accesses it via the Safari browser on iOS 6 devices. They are a simple and effective way of increasing your app’s download numbers by converting website visits into app downloads. When an iPhone, iPad, or iPod Touch with iOS 6 accesses the specified webpage, an unobtrusive, professional banner drops down from the top of the screen. This banner prompts the user to check out your mobile app. Don’t worry y’all, these banners aren’t anything like those hideous ads that you see in the free Android version of Angry Birds. The consistent look and feel combined with a small visual footprint ensures that the banner is generally accepted by iOS 6 users. Try not to use the banner on any pages that has absolutely nothing to do with your app. 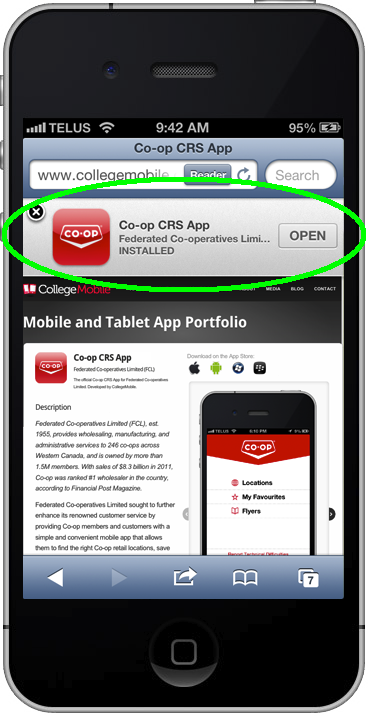 Putting the Smart App Banners in the right places will ensure they remain unobtrusive and interesting. By taking the above suggestions into consideration, you can effectively turn website visits via iOS 6 devices into app downloads. You won’t see a radical download rate increase in one day, but Smart App Banners will certainly help you over time. Leave a comment or contact us to learn more about Smart App Banners by Apple.